Mention Apple TV, Roku, the Xbox 360, or any garden-variety HDTV set, and the term “HDMI” will inevitably pop up—especially once the subject turns to plugging one home-video gizmo into another. So, what is “HDMI,” exactly? What does it stand for, and what does it do? Short for “High-Definition Multimedia Interface,” HDMI is essentially a connector—or, yes, an interface—between video and audio components. What kind of components? Think HDTVs, game consoles (like the PlayStation 3 or Xbox 360), Blu-ray disc players, HD DVRs (like the one you rent from your cable carrier), streaming-video boxes (like Apple TV or Roku), and home theater receivers (like those used to power surround speaker systems). A pair of standard HDMI ports lurking in the back of an HDTV (mine, in this case). 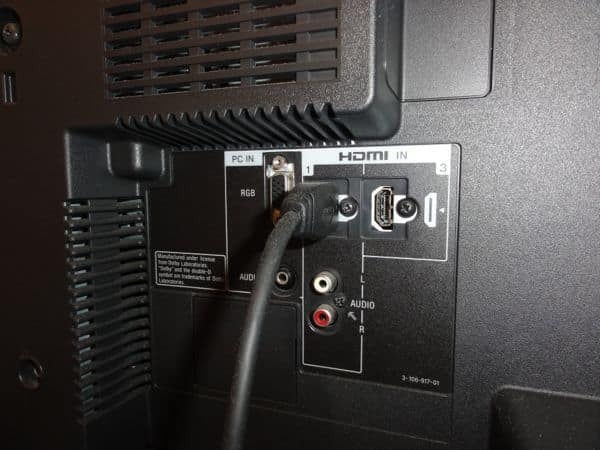 Unlike the analog coaxial, composite-video, and S-Video connections on yesterday’s TVs, HDMI connections are all-digital, and they’re capable of transmitting both high-definition video and lustrous surround sound through a single cable. HDMI cables aren’t the only kinds that handle HD video, mind you. So-called “component-video” cables, which boast a trio of plugs on each end, can transmit full-on HD video, as well. But component video is an analog, video-only connection—and besides, when it comes to the latest HDTVs, game consoles, and streaming TV set-top boxes, HDMI is the current standard. Besides handling both digital video and audio signals, HDMI interfaces also support a copy-protection system known as High-bandwidth Digital Content Protection, or “HDCP” for short—something you’ll probably never need to worry about, unless you’re trying to record HD movies off your cable box. Want to see what an HDMI port looks like? Just take a gander at the back of almost any HDTV set, and you’ll see one—or two, or three, or even more. They look like little rectangles, about a half-inch wide and a couple tenths of an inch high, with a “v” shape at the bottom corners. 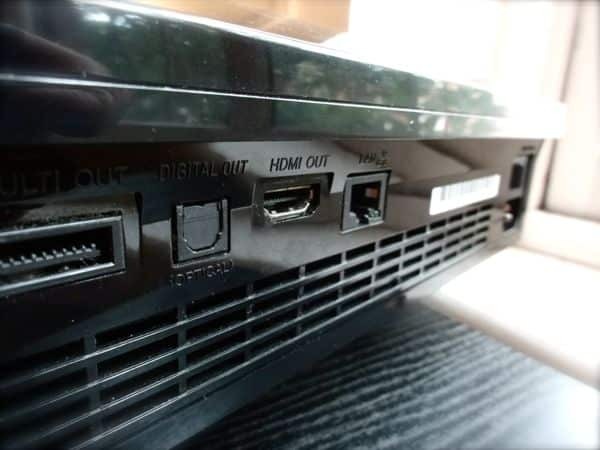 An HDMI port on the back panel of a PlayStation 3. A standard HDMI cable, meanwhile, will have twin “male” plugs on either end, with each plug a little less than half an inch long. 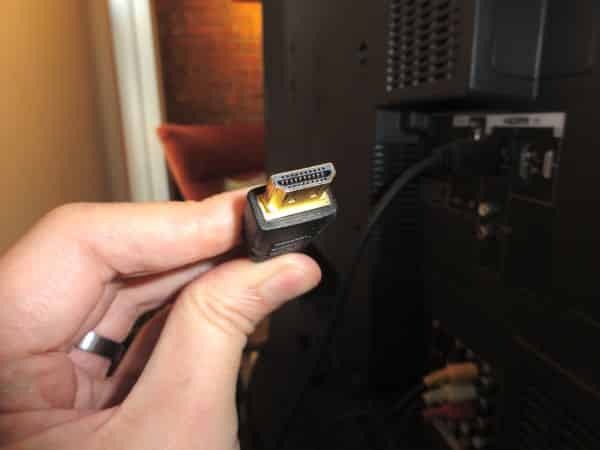 This type “A” HDMI connector is probably the only one you’ll ever have to worry about, although there are also smaller, “mini-HDMI” (or type “C”) plugs that you’ll find on certain high-end smartphones (like this one) capable of “mirroring” their displays on an HDTV set. Making the HDMI connection between, say, a Blu-ray player and your HDTV is a snap. Just plug an HDMI cable into the HDMI port of the Blu-ray deck, plug the other end into an open HDMI port on your TV, and you’re set—both in terms of sound and picture. 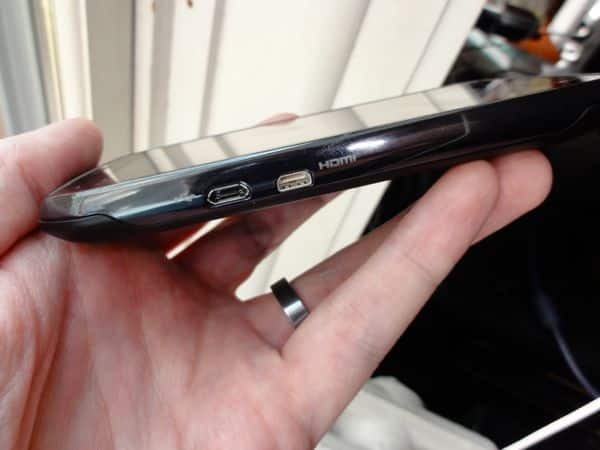 Some newer, high-end smartphones boast “mini” HDMI ports, like this one. Another possibility is to plug your Blu-ray player, game console, Apple TV, and other HDMI-equipped devices into the HDMI ports of a home-theater receiver, and then connect a single HDMI cable from the receiver to your HDTV. That way, your receiver will be able to send video from a selected source (like the Blu-ray player, or your Xbox) to your TV, while piping out Dolby or DTS surround sound through a set of home-theater speakers. So, what kind of HDMI cables do you need? Nothing all that fancy. Unless you’re a home-theater professional laying down yards and yards of line, a standard HDMI 1.3 cable should do—and you shouldn’t have to pay more than about $10 for a six-foot cable. Have more questions about HDMI, or home theater in general? Let me know! Reader mail: How much should I spend on an HDMI cable?